Names: Adiantum aleuticum is also known as A. pedatum var. aleuticum. Adiantum comes from the Greek, adiantos (unwetted), referring to how the leaves shed water. Aleuticum is derived from the Aleutian Islands. Pedatum means foot-like (usually a bird’s), referring to its fan-shaped fronds. 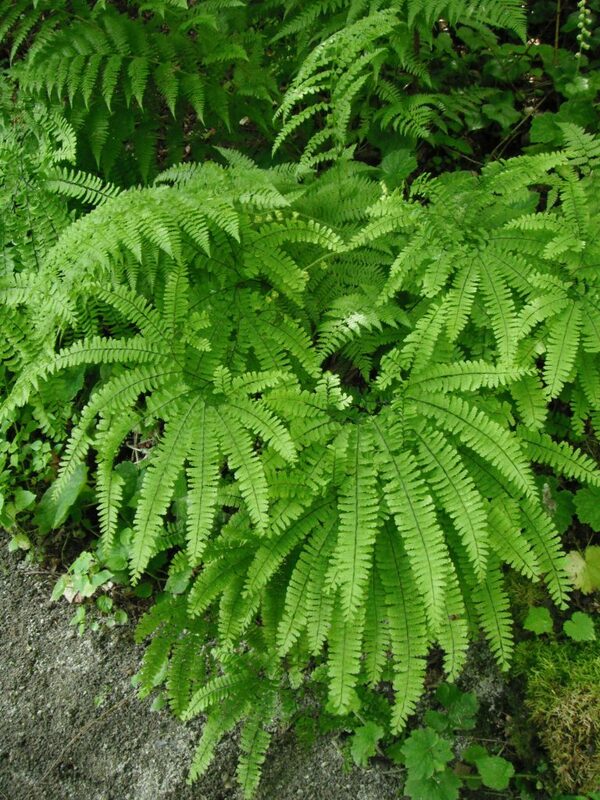 Common names include: Five-finger Fern and Northern or Aleutian Maidenhair. The term Maidenhair may have been derived from the species A. capillus-veneris, (literally Venus’s hair), perhaps due to the dark, glossy hair-like leaf stalks. Ginkgo biloba is called “Maidenhair Tree” because the leaves resemble the pinnules of Maidenhair ferns. 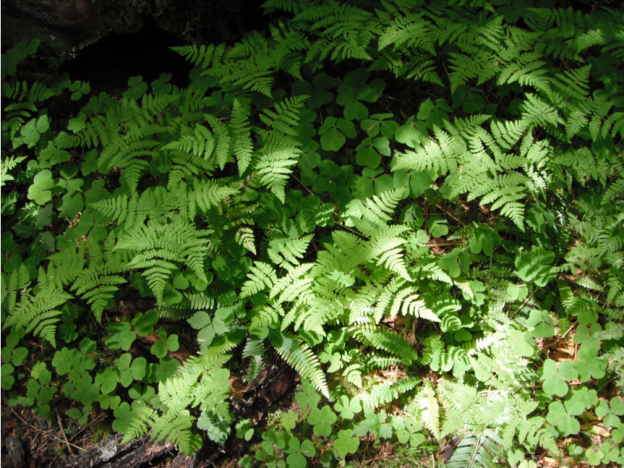 Relationships: There are about 200 species in Adiantum worldwide, with about 9 native to the mainland United States and Canada, and about 11 more found in Puerto Rico and the Virgin Islands. Northern Maidenhair, Adiantum pedatum, from the Eastern United States, is very similar. A key must be used to distinguish the two, — A. aleuticum sometimes has ascending or vertical pinnae, A. pedatum always are horizontal. Distribution: Western Maidenhair can be found from the Aleutian Islands and southeast Alaska to Chihuahua in Mexico. It is more common along the Pacific Coast, but can be found in some areas of the inland Rocky Mountain Region, and in some northeastern states, Quebec and Newfoundland (listed as endangered in Maine). Growth: This species grows 4-30 inches (10-75 cm) tall. Habitat: It grows in shady, moist, humid forests, or on rocks and cliffs, often within the spray zone of waterfalls. Diagnostic Characters: Western Maidenhair is a deciduous perennial with solitary (or few) fronds. It often grows in large colonies. Dark brown to purplish-black petioles divide into 2 and then divide again, spreading parallel to the ground, radially to form 6-10 “fingers.” Each leaflet or pinnule is fan-shaped but is usually skewed long on one side, creating an oblong shape. Oblong sori are found on the edges of the upper lobes of the leaflets and are covered by inrolled leaf margins (false indusia). In the Landscape: Maidenhair Ferns are prized by gardeners for their delicate, airy fronds. Western Maidenhair is sure to evoke memories for avid hikers of enchanting waterfalls, where it grows on cliffs within reach of water spray. But the gardener should make sure this charmer gets planted in a shady place with plenty of moisture. 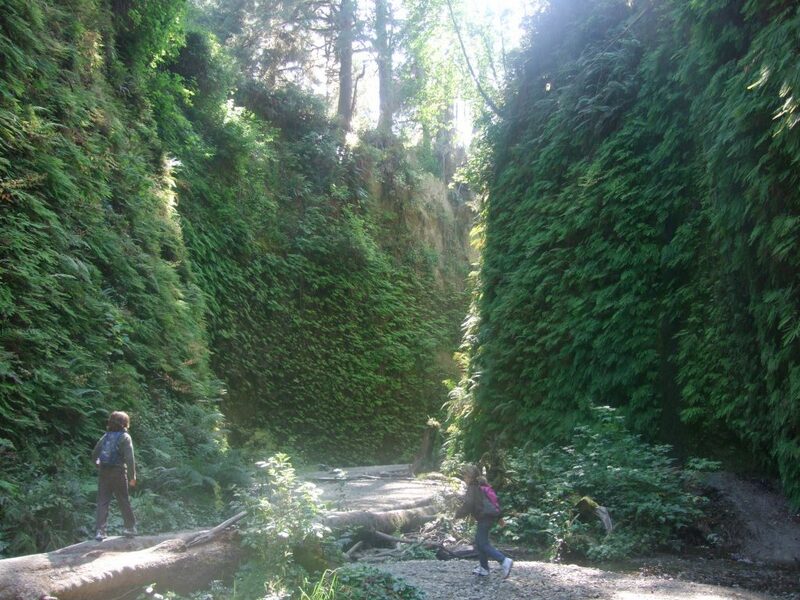 The Cliff walls in Fern Canyon in Redwood National Park are mostly covered with Maidenhair Ferns. 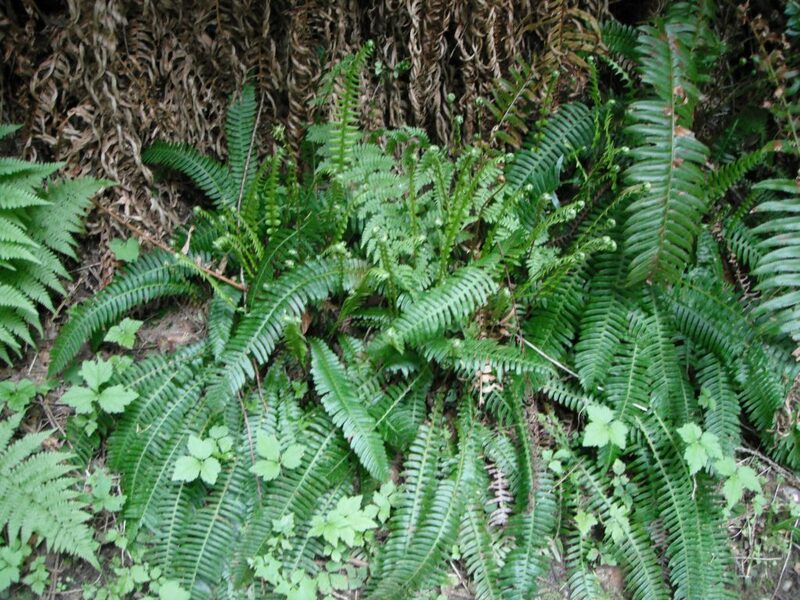 Use by People: Natives used the stems of Maidenhair Fern in basketry designs. They also used a tea made from the leaves as a hair wash. The Quinault burnt the leaves and rubbed ashes in their hair to make it long, shiny and black. California natives used the stems for pierced earrings, either alone or with feathers; inserting them into the ear lobe to keep the hole from closing. The leaves were also chewed for internal wounds, chest pain, or stomach trouble. Capillaire cough syrup originally made from A. capillus-veneris has also been made from A. aleuticum. This entry was posted in Ferns on November 26, 2018 by habitatdana. Names: The genus is named after British botanist Thomas J. Woodward. Chain Ferns get their common name from the chain-like rows of oblong sori on the undersides of the pinnae. The species name, fimbriata means fringed, due to the margins having many tiny spines. 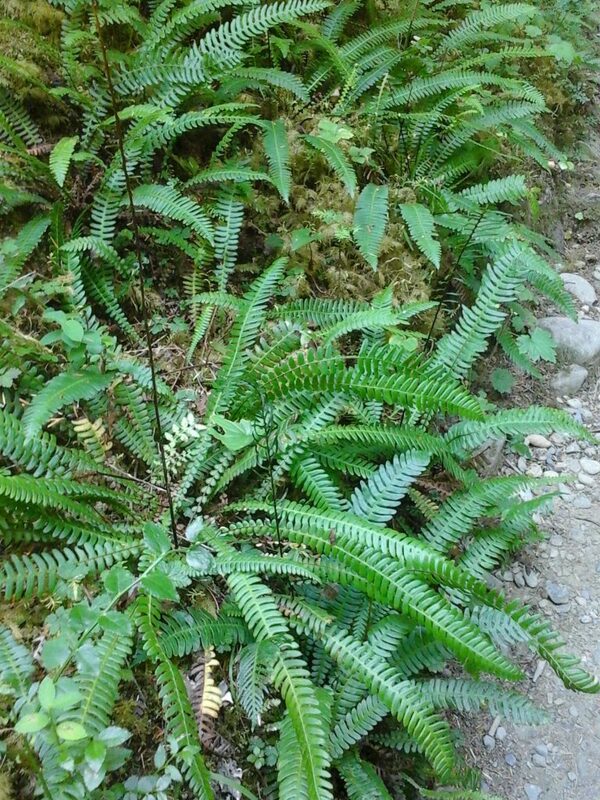 This species may also be called Western Chain Fern or Giant Chain Ferry. Relationships: There are about 14-20 species of Woodwardia in the northern hemisphere, with only 3 species in the U.S. and Canada. 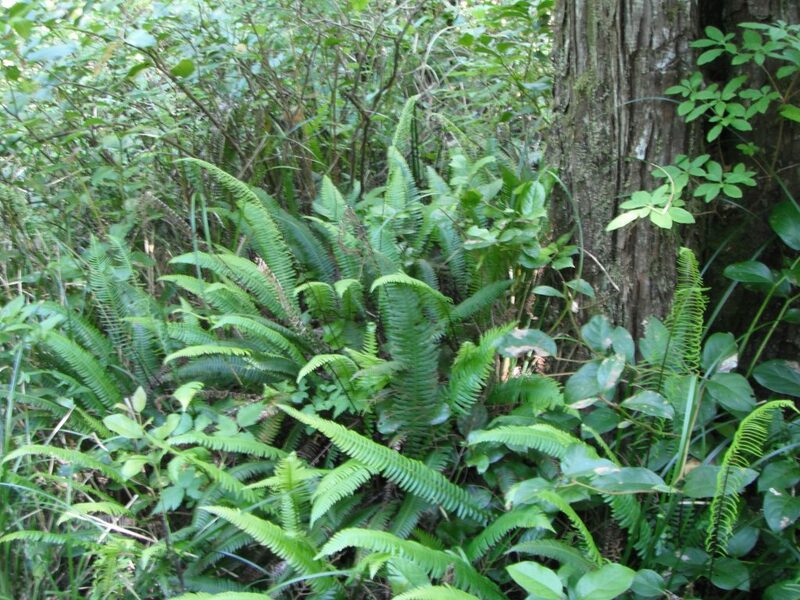 Distribution: Giant Chain Fern has been found in Texada and Vancouver Islands in British Columbia, and in the Puget Sound region of Washington where it is listed as sensitive. It is more common from southern Oregon and California to northwest Mexico, mostly near the coast, but can also be found inland in Arizona and Nevada. 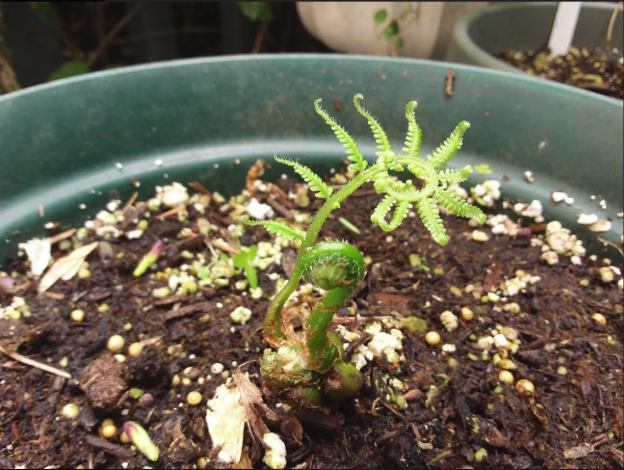 Growth: Fronds typically grow 1-5 feet (0.4-1.5 m) but may grow up to 9 feet (3m). 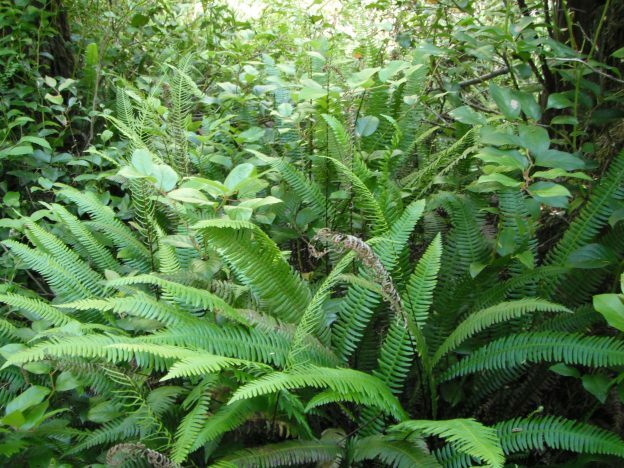 Habitat: Giant Chain Fern grows in mild, wet coastal forests. It is sometimes found growing on seepy coastal cliffs or in desert areas near shady seeps. Wetland designation: FACW, it usually occurs in wetlands, but is occasionally found in non-wetlands. Diagnostic Characters: Evergreen fronds grow upright or slightly bent, from a short, robust rhizome. They are broadly feather-shaped with once-pinnate, deeply cut segments; margins having pointed teeth tipped with tiny spines. In the Landscape: About Woodwardia fimbriata, Hitchcock writes: “This is surely our choicest large fern.” Being the largest, it is certainly the most impressive of all our ferns, it performs best in a woodland garden especially next to streams, bogs, springs or ponds, but it can also grow in full sun with adequate summer moisture. It can be very striking as a focal point or when planted against a wall in a shady location. It readily produces “sporeling plants” in wet areas. It also may be propagated in the spring by division of the rhizomes–but judicious collection of spores is preferable where this species is rare. Use by People: Natives in California used the leaves for fiber to make baskets, and to line the top and bottom of an earth oven for baking acorn bread and other foods. This entry was posted in Ferns on November 19, 2018 by habitatdana. 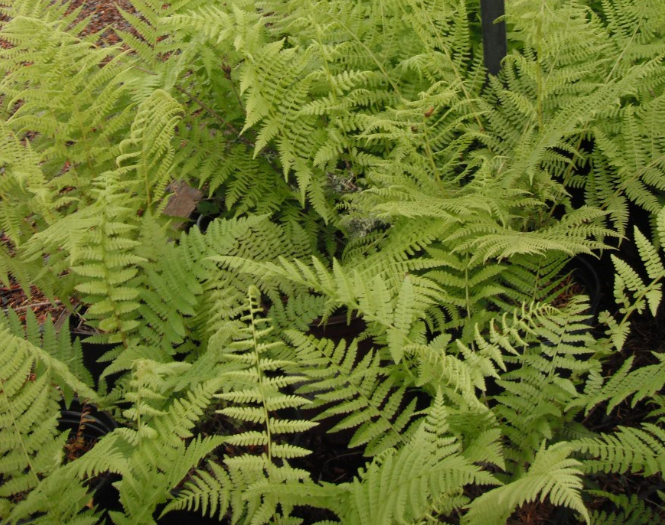 Names: Blechnum comes from a general Greek name for fern. Spicant means spiked referring to the erect fertile fronds. Other common names include: Hard Fern or Rough Spleenwort. It also has been known as Struthiopteris spicant. 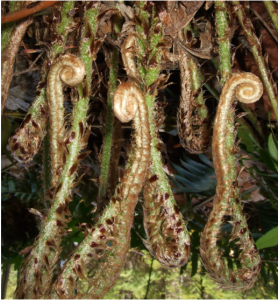 Relationships: There are about 150-220 species of Blechnum (generally known as Hard Ferns or Midsorus Ferns) throughout the world, most are from tropical regions in the southern hemisphere, with just a few in the temperate regions of both hemispheres. This genus spans the globe from the southern-most fern species, B. penna-marina, from Cape Horn to arctic regions in Iceland and Norway. A few Ecuadorean species reach tree stature growing up to 3 meters tall. Only two other species occur in the mainland United States (in the Gulf States & Florida)—these and 5 additional species also occur in Puerto Rico. 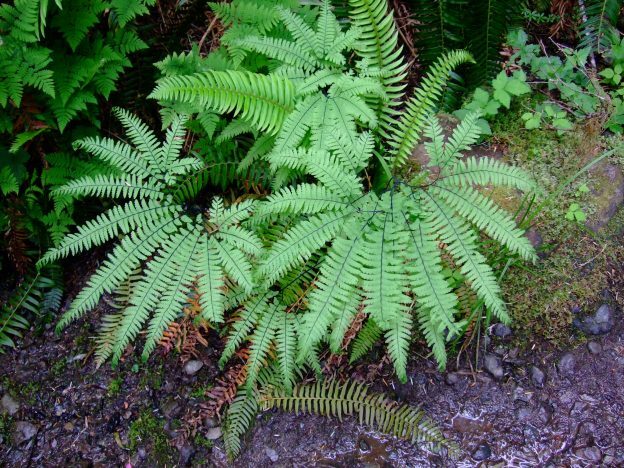 Distribution: Deer Fern is found in Europe, northern Asia, Japan and in western North America from southern Alaska to the central California coast; mostly west of the Cascades, but it also is reaches east to the Idaho panhandle. Fertile fronds emerging vertically from the center of the more horizontal sterile fronds. Diagnostic Characters: Deer fern has two types of fronds: narrow, evergreen, once-pinnate (or deeply lobed), sterile leaves spread outward, growing 10-80 cm long; even narrower, taller (1-3 feet), fertile fronds grow erect, from the center, soon withering after spore dispersal. The once-pinnate leaflets on the fertile fronds are much narrower and roll almost tube-like around the continuous sori. Leaf stalks are a dark, purplish-brown, and grow from a short, thick rhizome. 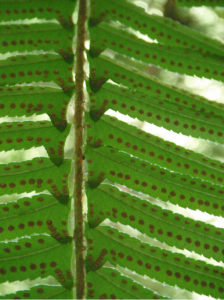 Fertile fronds have edges that are rolled under. Habitat: This species grows best in moist to wet forests and along streambanks. Wetland designation: FAC+, Facultative, it is equally likely to occur in wetlands or non-wetlands. In the Landscape: Hitchcock writes: Deer Fern “is a truly choice fern usable in many places in the garden, but so common as to have little appeal to most gardeners.” That said, it is one of the best native ferns for landscapes, second only to Sword Fern. Although at home in a woodland garden, it can adapt to many situations, given adequate shade and/or moisture. 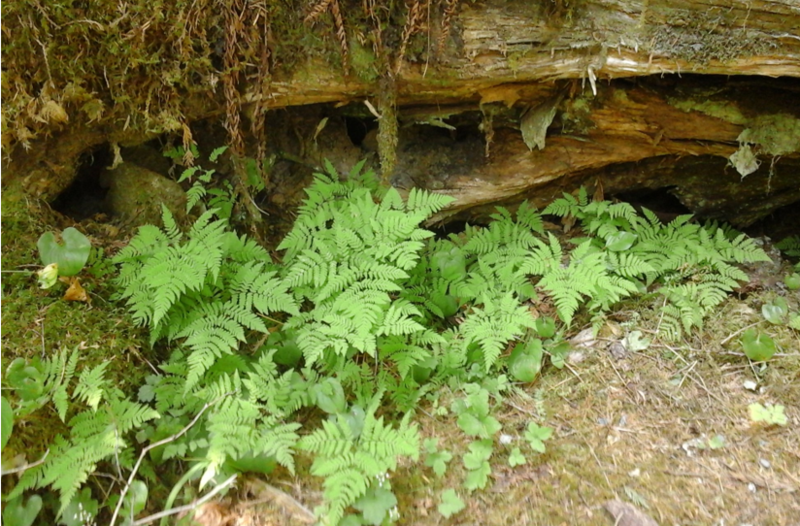 Deer Fern has also been used as a houseplant. Use by People: The roots and young shoots were cooked and eaten as an emergency food; the young tender stems can also be peeled and the center portion eaten to relieve hunger; the leaves eaten to prevent thirst. The leaflets have been chewed to treat cancer, lung disorders and stomach problems; and a decoction of the root to treat diarrhea. The leaves were used medicinally on skin sores, which is said to have been learned by watching deer rub their antler stubs in this plant. 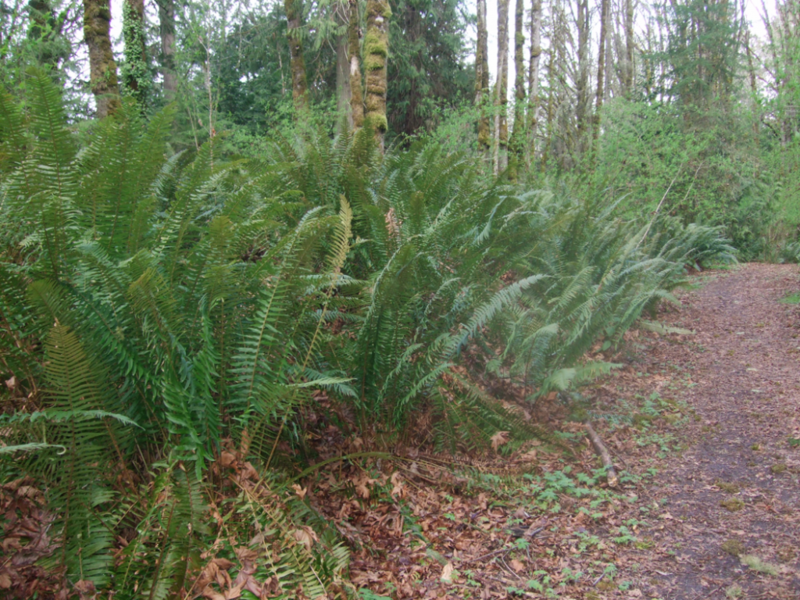 The fronds were also used to line pits for baking camas (along with Sword Fern) and have been used for bedding. 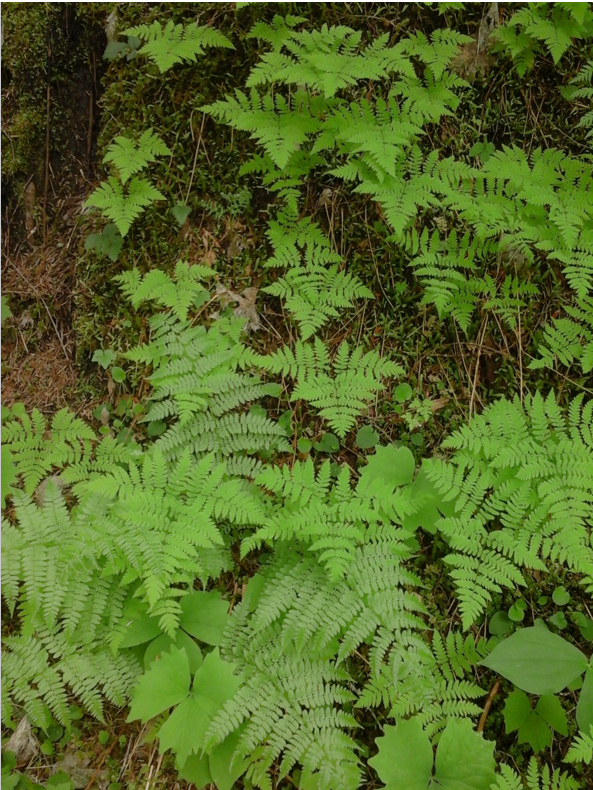 Use by wildlife: Deer fern provides valuable forage for deer, Mountain Goat, Bighorn Sheep, elk, moose, and caribou. This entry was posted in Ferns on May 21, 2018 by habitatdana. Names: The genus is named after Carlo Matteucci an Italian physicist and pioneer in the study of bioelectricity. Struthio is the ostrich genus; pteris means fern— the fronds resemble ostrich feathers. It is also known as Shuttlecock Fern, because of the way the fronds grow in a clump, like the feathery tail of a badminton birdie! 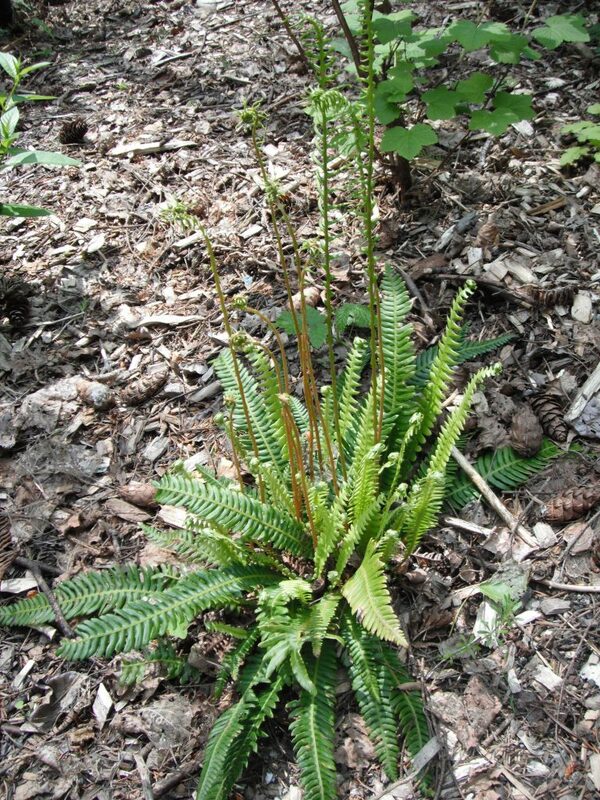 Relationships: Ostrich Fern is the only species in the genus Matteuccia. Distribution: It is found in many of the temperate regions in the northern hemisphere. In North America, it is found throughout much of the northeast and across Canada; but only reaches the west coast in southern Alaska and British Columbia. It is listed as rare, of special concern or vulnerable in Indiana, Rhode Island and New York. Growth: Sterile, deciduous fronds grow to nearly 6 feet in moist, moderate climates. In less than ideal conditions it is often much shorter, usually 1-5ft. (30-140cm). Ostrich Fern spreads by underground rhizomes to form new crowns and often grows in dense colonies, resistant to destruction by floodwaters. Habitat: Ostrich Fern is hardy to extreme cold and is most often found in lowland or montane alluvial forests, riverbanks and sandbars. Diagnostic Characters: The sterile, bright-green fronds grow nearly vertical in vase-like clusters. They are broadest in the middle upper ¼ of the frond and are once-pinnate with deeply cut pinnae. Brown, fertile fronds are shorter (60cm) and narrower, leaf tissue curling over the spore cases; they persist over winter, releasing spores in early spring. 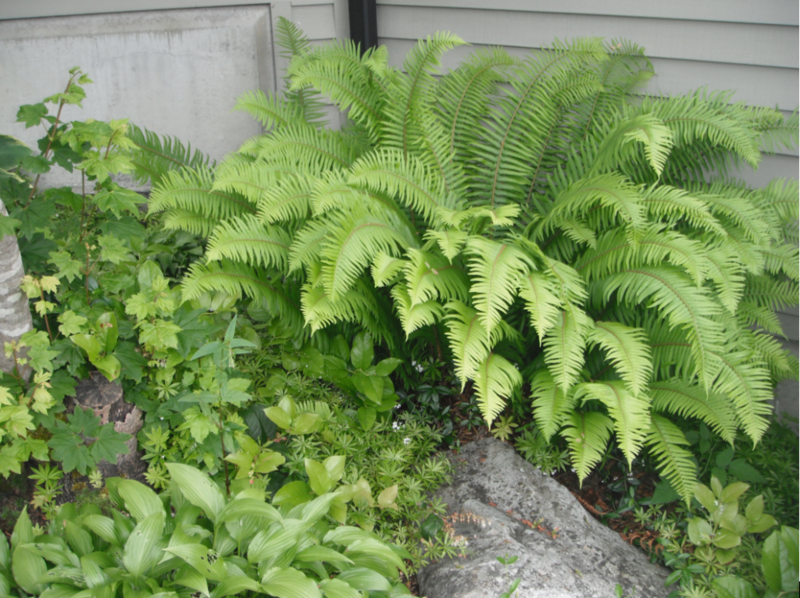 In the Landscape: Ostrich Fern is a popular garden ornamental. Although spectacularly beautiful in the early summer, it may start looking haggard later in the summer, depending on local conditions. It prefers a moist, cool location protected from winds. It is easily propagated by division. Use by People: The fiddleheads are sometimes eaten raw, or cooked, most notably in Japan; the flavor is sometimes compared to asparagus. As with all ferns, caution is advised, especially consuming raw parts. Use by Wildlife: It is used as a food plant by the larvae of some moths. This entry was posted in Ferns on May 14, 2018 by habitatdana. Names: Gymnocarpium means naked fruit because the spore cases are not covered with an indusium. The common name and specific epithet dryopteris refers to its similarity to the genus Dryopteris, (which literally means Oak (or Wood) Fern). Disjunctum refers to the separation of this species from G. dryopteris. Relationships: There are only about 8 species of gymnocarpium, mostly in the temperate regions of the northern hemisphere. 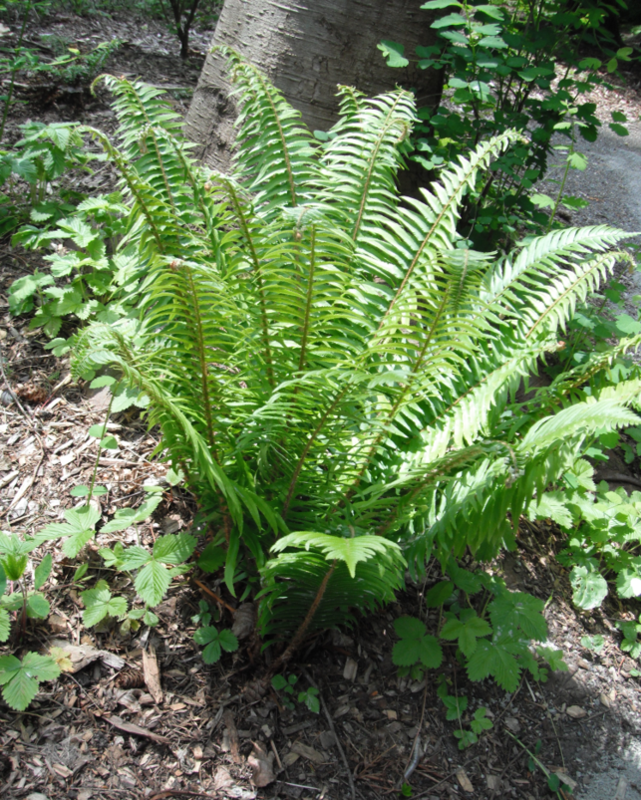 Common names of G. dryopteris include Western or Northern Oak Fern. Dryopteris disjuncta is a botanical synonym. Many of the western forms appear to be diploid, as opposed to the European and eastern U.S. tetraploids, and are now often given the name, Pacific or Western Oak Fern, G. disjunctum (disjunct- means separated). Distribution: G. dryopteris is distributed throughout the Northern Hemisphere, whereas G. disjunctum is confined to the coastal northwest of North America and the Pacific coast of Russia. 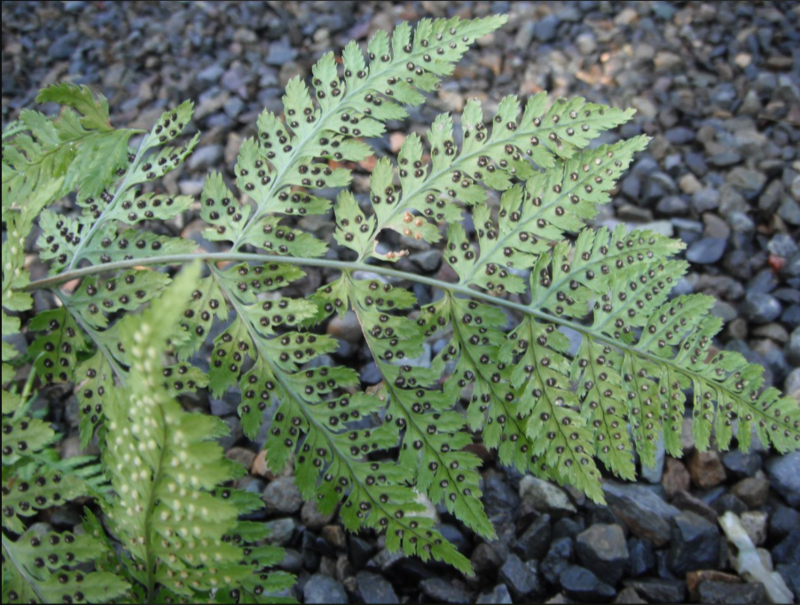 G. dryopteris is listed as endangered, threatened or vulnerable in Illinois, Maryland, Iowa, Ohio, Rhode Island, and New York. 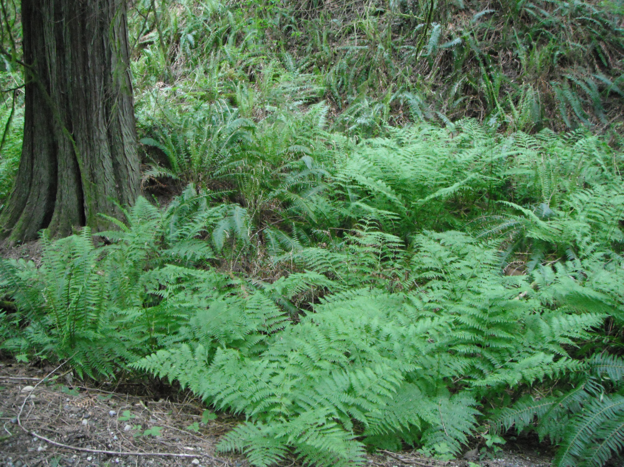 Growth: Pacific Oak Fern is generally a larger plant than Western Oak Fern (10-40 cm vs. 5-25 cm long fronds), with more divided leaves and smaller spores. It is hard to tell the difference between these two species and I admit I am not an expert, but I believe this is a Pacific Oak Fern. 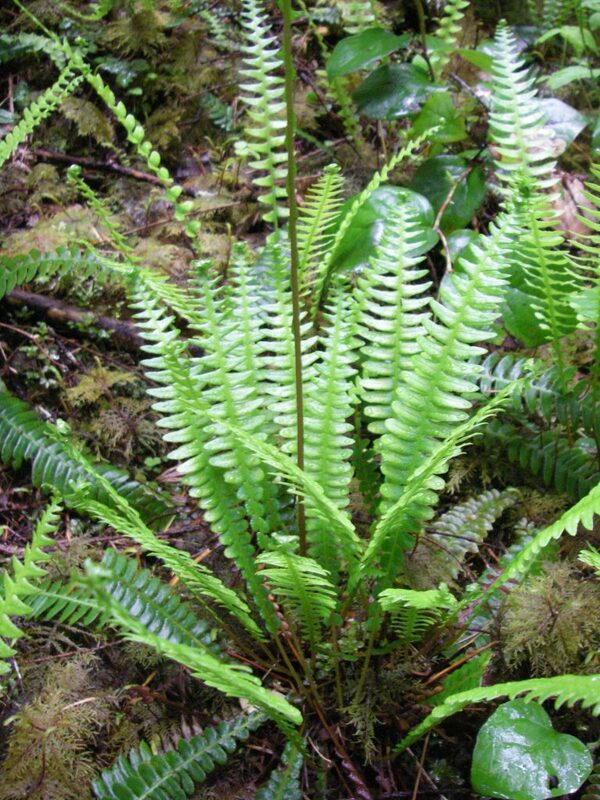 Habitat: In the Pacific Northwest, these ferns grow in shady, moist woods, streambanks and wet cliffs. Despite its name, it is not usually found in association with oaks, preferring mixed coniferous forests. Wetland designation: FAC, Facultative, it is equally likely to occur in wetlands or non-wetlands. 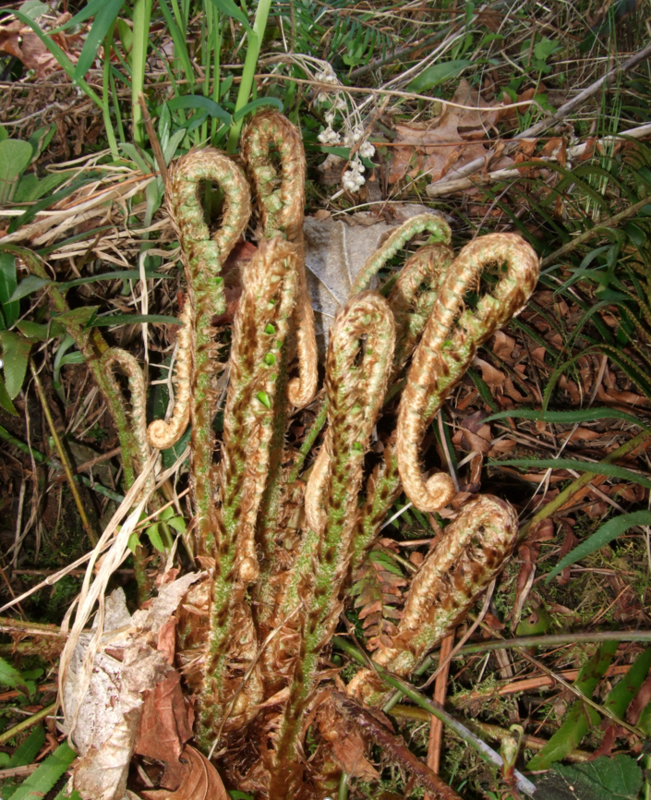 Diagnostic Characters: Although the fronds are most often born singly, they spread by rhizomes, forming large colonies. 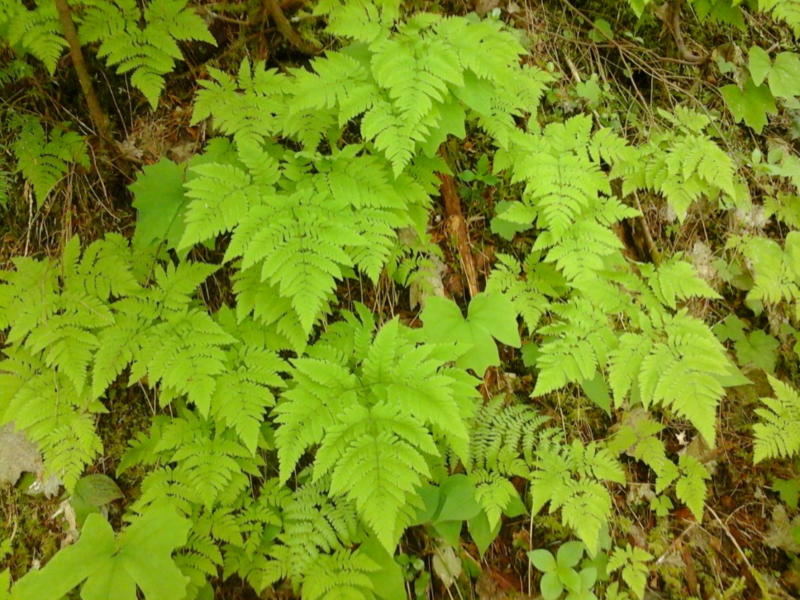 The deciduous fronds are broadly triangular, 2-3 pinnate and hairless. Spore cases are round and uncovered. In the Landscape: Oak Ferns make a nice groundcover in a woodland garden; their lush, bright green fronds brighten a dark forest floor. They can be propagated by division. Oak Fern and Vanilla Leaf on a forest floor. 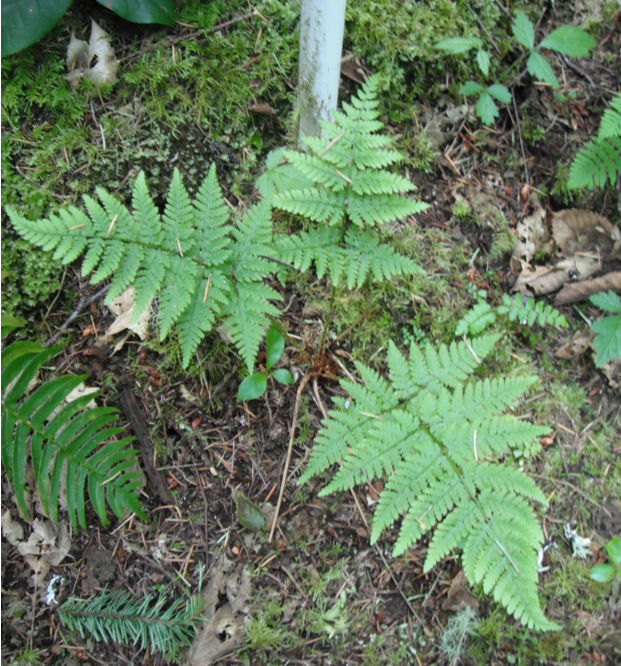 Use by People: The presence of Oak Fern was a sign of water for the Okanagan tribe when travelling through the mountains. 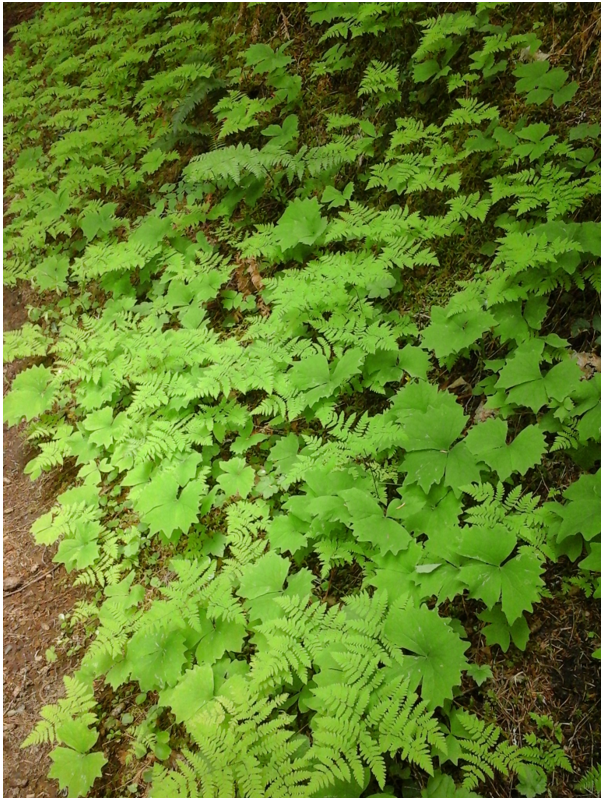 Use by Wildlife: Grizzly Bear and Elk have been observed eating Oak Fern. This entry was posted in Ferns on March 19, 2018 by habitatdana. 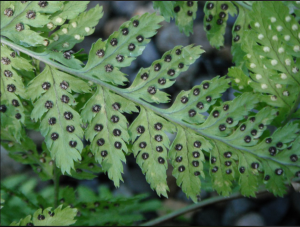 Relationships: There are about 180 species of Athyrium worldwide; with only two species in the mainland United States. 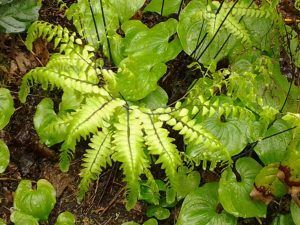 Distribution: Lady Fern is abundant throughout the northern hemisphere; found in all the states and provinces in North America. Habitat: It grows in moist to wet forests, meadows and streambanks. Wetland designation: FAC, Facultative, it is equally likely to occur in wetlands or non-wetlands. 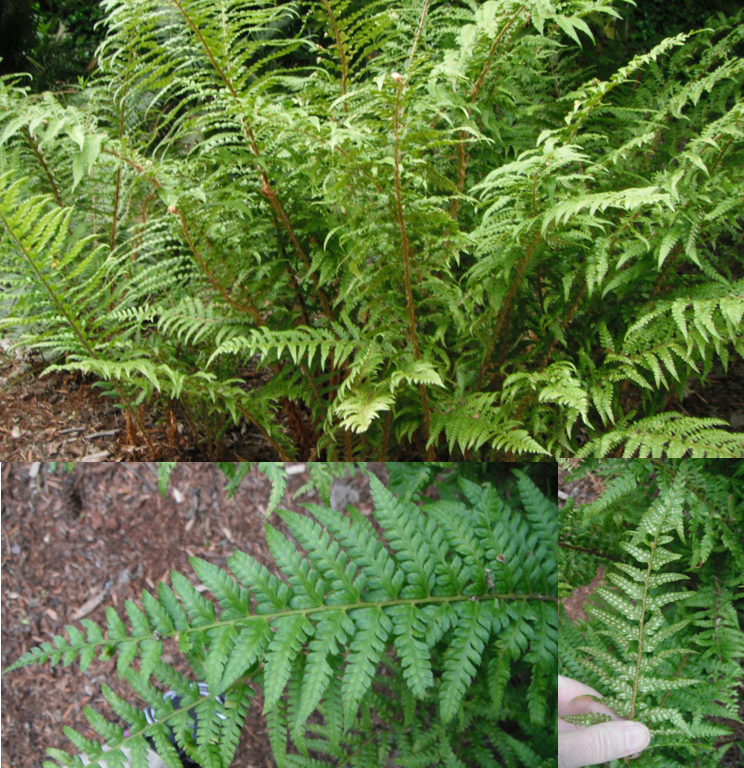 Growth: Lady Fern grows to 6 feet, (2m) tall. Diagnostic Characters: It has large, feathery 2-3 pinnate fronds, tapering at both ends, arising from a cluster of scaly rhizomes. Sori, or spore cases, are elongated and curved, oblong to horseshoe-shaped. In the Landscape: This species, with its graceful, lacy, bright, yellow-green fronds, is very eye-catching. It may, however be a little too aggressive for a formal garden, but is ideal for a wild, moist, woodland garden, where it can freely multiply. It dies back completely in winter. Some may consider the withered fronds a bit unsightly. Use by people: Natives ate the roots/rhizomes after roasting or baking in a pit. They should always be cooked prior to consumption; many ferns contain carcinogens, so caution is advised. A tea made from the rhizomes or stems were used for various women’s complaints and to ease pain. The leaves were used to cover camas while baking, to cover berry baskets and to wipe fish. Use by Wildlife: Roosevelt Elk and deer Eat Lady Fern in the fall on the Olympic Peninsula, but it is not a major food species. Grizzly Bears also eat the fronds. Alpine Lady Fern, Athyrium americanum is found on open, rocky slopes along streams in our mountains. It is also known as A. distentifolium var. americanum, or A. alpestre var. americanum. It is much smaller, with narrower, crinkled fronds. This entry was posted in Ferns on November 6, 2017 by habitatdana. 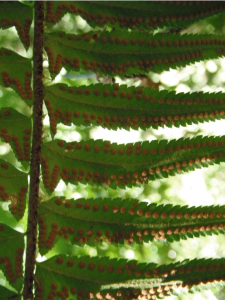 Names: Polystichum means many rows, referring to the arrangement of the spore cases on the undersides of the fronds. Munitum means armed with teeth, referring to its toothed fronds. Western Sword Fern is also known as Sword Holly Fern, Giant Holly Fern, Christmas Fern, Pineland Sword Fern, or Chamisso’s Shield Fern. Relationships: There are about 260 species of Polystichum worldwide with about 16 native to North America; and about 10 native to the Pacific Northwest. 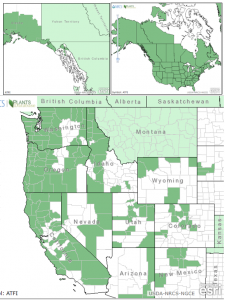 Distribution: Western Sword Fern is found from southeast Alaska to the central California coast, mostly on the west of the Cascades; eastward to northern Idaho into northwest Montana. Disjunct populations have been found in South Dakota and on Guadalupe Island off Baja California. Growth: Western Sword Fern grows up to 4.5 feet (1.5m) tall. 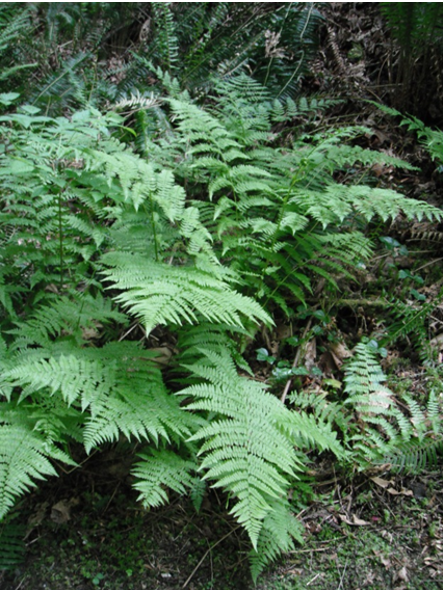 Habitat: It is usually found in moist forests, but it is probably the most adaptable of all our ferns and can take a bit more sun than other ferns and some dry periods. Wetland designation: FACU, it usually occurs in non-wetlands but occasionally is found in wetlands. 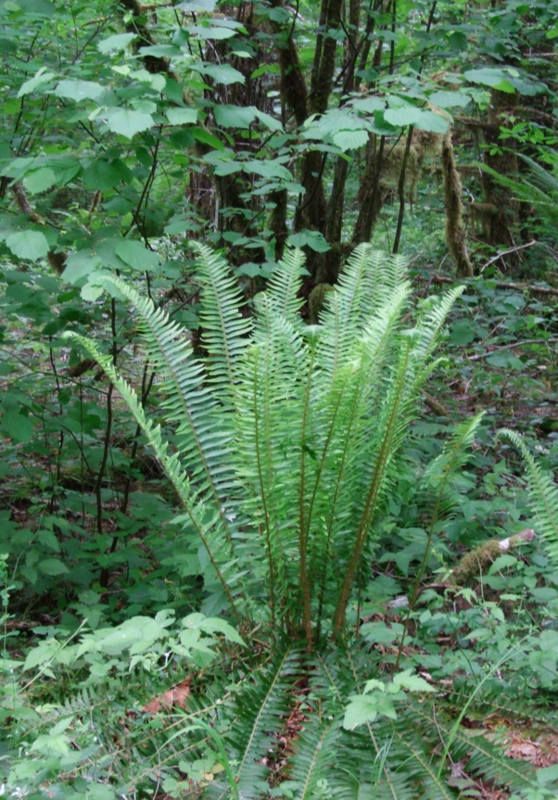 Sword Fern is very common in the understory in our westside forests. Diagnostic Characters: Large, erect fronds form from a crown of scaly rhizomes. 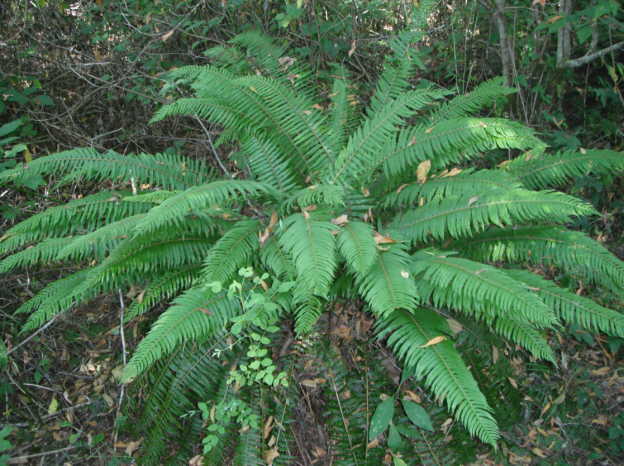 Fronds are once-pinnate with alternate pointed, sharp-toothed leaflets; each leaflet with a small lobe pointed forward at the base. Sori (spore cases) are large and round arranged in two rows on the undersides of the fronds halfway between the midvein and margins. 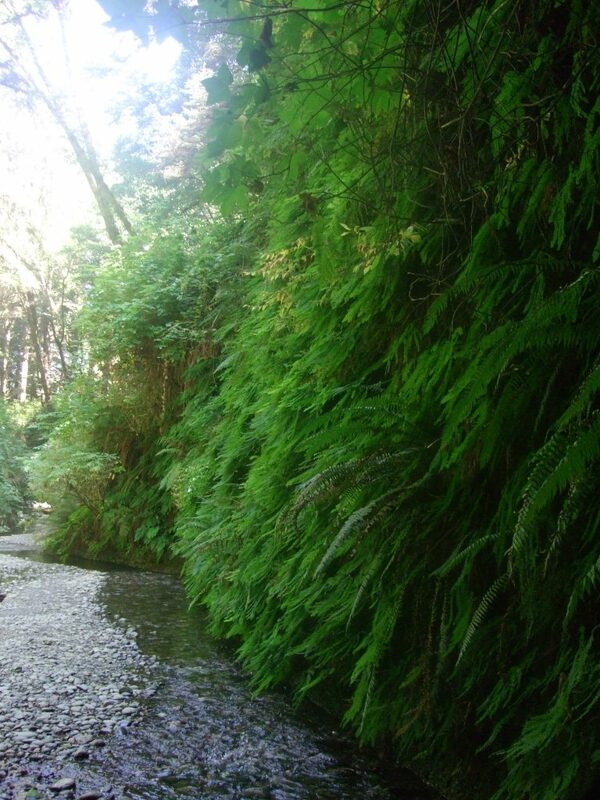 In the Landscape: Western Sword Fern is the most widespread and versatile of all our native ferns. Although at home in woodlands, it often adapts to drier, sunnier sites in landscapes. Its tall arching fronds are most impressive planted in drifts in a woodland garden. When grown in the sun, the fronds are dwarfed and more erect; and have pinnae (leaflets) that are crisped and crowded so that they overlap and appear overlapping. Young ferns are also more frilly-looking. Use by natives: The roots/rhizomes were generally viewed by natives as a famine food. (This plant probably should only be consumed in small quantities, if at all, due to possible presence of carcinogens or other toxins.) The rhizomes were peeled and then boiled or baked in a pit on hot rocks covered with fronds. The fronds were used frequently for lining baking pits and storage baskets; and were spread on drying racks to prevent berries from sticking. They were variously used for placemats, floor coverings, bedding; and for games, dancing skirts and other decorations. They are frequently used today in flower arrangements. 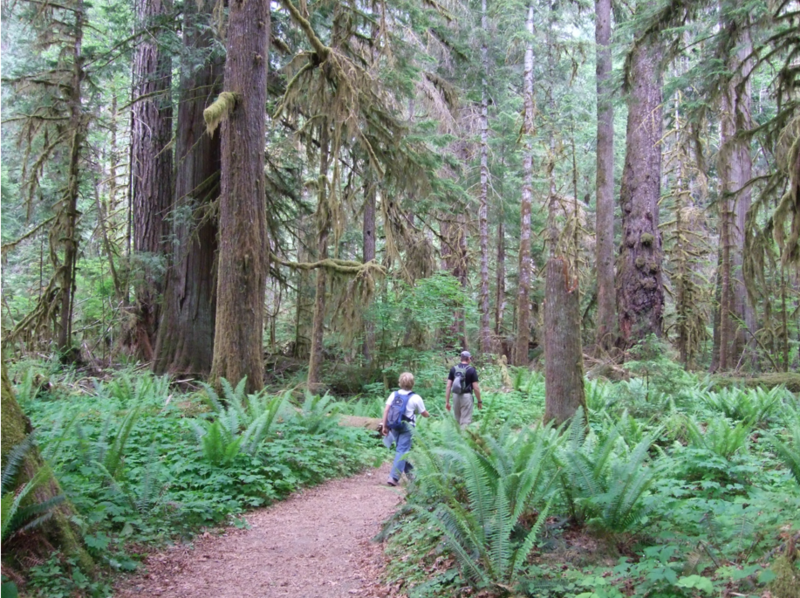 Use by wildlife: Western Sword Fern is browsed by deer, elk, Black Bear and Mountain Beaver; frequently eaten by Roosevelt Elk on the Olympic Peninsula. The fronds may be used as nesting material for rodents. Narrowleaf Sword Fern, P. imbricans is similar to Western Sword Fern and once was classified as a variety of P. munitum. It is smaller (20-60cm) with overlapping, somewhat infolded leaflets and only scarcely scaly stipes (petioles). It is a better choice for a sunny spot. Anderson’s Holly Fern, P. andersonii is much rarer; found in deep woods in the mountains. Fronds grow to 1 meter. It has a conspicuously chaffy fiddlehead and leaf stalk. Pinnae are deeply cut making it appear doubly pinnate. Bulblets form at the base of pinnae near the tip and may grow into a new plant when the frond touches the ground! Braun’s Holly Fern, P. braunii, is big (to 1m) and has twice pinnate leaves with no basal lobes. It grows in moist woodlands. (Native to British Columbia, southern Alaska, the Idaho panhandle—Listed as threatened or endangered in several eastern U.S. states). California Sword Fern, P. californicum, has finely toothed leaflets rather than the prominently toothed leaflets in Western Sword Fern; each tooth is short, ending abruptly. It will grow in a variety of habitats from moist, shaded woods to open slopes, and dry, rocky terrain. It is rare in Washington & Oregon, listed as sensitive in Washington, only found in or near the Cascades in Pierce & Thurston counties). Kruckeberg’s Holly Fern, P. kruckebergii is believed to be a fertile hybrid of P. lonchitis & P. lemmonii. It is found sporadically in the Cascades, Sierras, & Rocky Mountains on rocks and cliffs and is considered rare or imperiled in Alaska, Montana, Idaho, California and B.C. ; and “of concern” in Oregon. Fronds are about 10-25cm long. Short leaflets are oval to triangular, overlapping and twisted; with teeth tipped with spines. It is named after Dr. Arthur Kruckeberg, the well-known botanist and native plant gardener and enthusiast. Kwakiutl Holly Fern, P. kwakiutlii is known only from the type specimen, collected at Alice Arm, British Columbia in 1934. It is presumed to be one of the diploid progenitors of P. andersonii. It also produced bulblets, but differs from P. andersonii in its completely divided pinnae (leaflets). Kwakiutl is a name applied to the native people in British Columbia on Vancouver Island and surrounding areas. 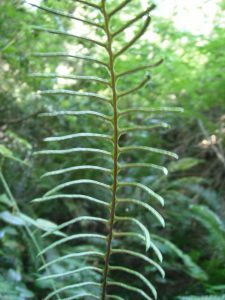 Lemmon’s or Shasta Holly Fern, P. lemmonii: Fronds are twice pinnate; pinnae have no spines and are overlapping and twisted, making it appear cylindrical. This species grows in serpentine rock crevices; and is found sporadically in the Cascades from B.C. to northern California. It is only known from one site in B.C. where it is listed as threatened. Northern Holly Fern, P. lonchitis, grows in mountains, often in rock crevices, throughout much of the northern hemisphere. Lonchitis is from the Greek logch meaning spear, referring to its spear-shaped leaves. It is once pinnate with spiny leaflets; resembling a miniature Sword Fern. It is listed as endangered in New York; and is on a review list in California. 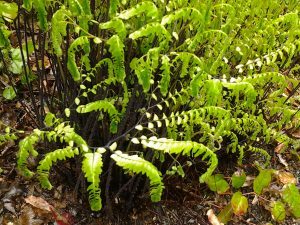 Mountain Holly Fern or Rock Sword Fern, P. scopulinum is also like a smaller Sword Fern but is shinier and more leathery with spiny-toothed leaves. It is nearly bipinnate with long hairs on the teeth of each leaflet. It is found in dry coniferous forest or more commonly on cliffs and talus slopes. It is more frequent east of the Cascades and the Rocky Mountains; it also grows in eastern Canada. Alaska Holly Fern, P. setigerum, is presumed to a hybrid between P. munitum and P. braunii. Fronds are 2-pinnate about the middle, finely spiny-toothed. It is found in lowland coastal forests in Alaska and B.C. It may be able find a niche in a cool, moist woodland garden. This entry was posted in Ferns on October 30, 2017 by habitatdana. Names: The specific epithet, opulus appears to refer to the Italian Maple, Acer opalus (opalus for opal), due to its maple-like leaves, rather than any opulent characteristic. Viburnum opulus is sometimes called Highbush Cranberry in our region, but that name is more often used for Viburnum edule. The American Cranberry Bush (also known as V. trilobum) is a variety of the European Cranberry Bush. The species and some of it’s cultivated varieties are known in in other parts of the world as Guelder Rose, Water Elder, European Cranberrybush, Cramp Bark, or Snowball Tree. 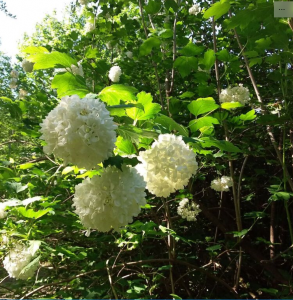 Relationships: There are about 150-175 species of Viburnum in temperate regions of the Northern Hemisphere with a few species found in mountainous regions of South America, Southeast Asia & Africa (in the Atlas Mountains). There are about 20 native to North America. 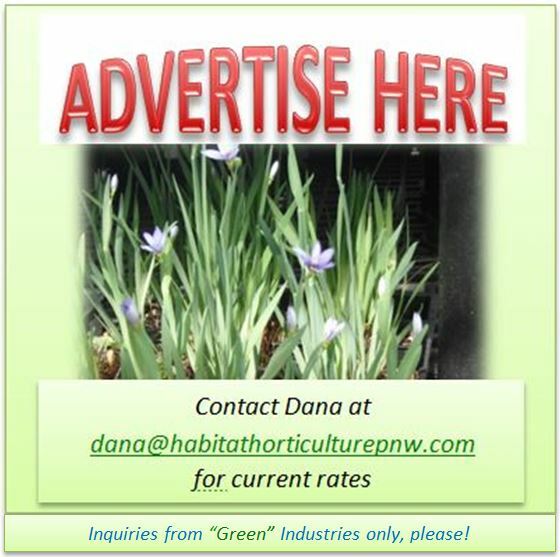 Many species are popular garden and landscape plants. Several hybrids and cultivated varieties. have been developed. They are grown for their flower display and/or showy fruit, Some have fragrant flowers; some with attractive or unusual evergreen leaves or fall color. 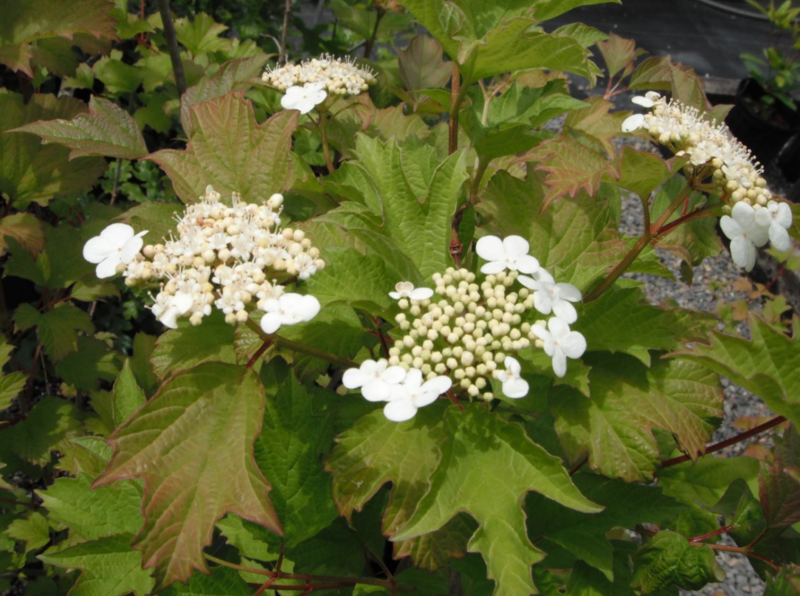 Distribution: Viburnum opulus is also native to Europe, North Africa and Central Asia. It is found from southern British Columbia and in scattered locations in Washington State (on the fringes of Lake Washington, the Columbia River Gorge and near the Idaho border. ); eastward, it is found sporadically across the northern United States and Canada, more common in the Great Lakes region to the eastern seaboard. American Cranberry Bush is listed as endangered in Indiana; threatened in Ohio; and rare in Pennsylvania. It is distinguished, with difficulty from the European form which occasionally escapes cultivation (more often in the eastern U.S.), by its skinnier somewhat longer stipules, and shorter, squatter petiolar glands. Growth: This species can be a large shrub growing to 12-15 feet (1-4m) tall and as wide or wider. 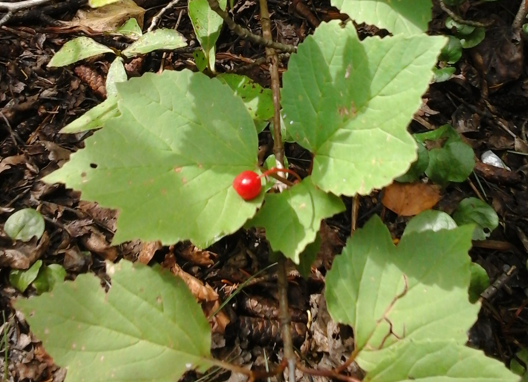 Habitat: American Cranberrybush is found in moist, open woods. Wetland designation: FACW-, it usually occurs in wetlands, but is occasionally found in non-wetlands. Diagnostic Characters: Opposite leaves are palmately 3- veined and 3-lobed and coarsely toothed. Flowers are a typical, white “lace-cap”—a flat-topped cluster of tiny flowers ringed with larger, showier, sterile flowers. Red, shiny fruits are berry-like drupes, each with a flattened stone. In the Landscape: Having long been a garden favorite, Viburnum opulus, is an outstanding landscape shrub. The species has attractive lacy, white flowers in the summer, followed by bright red berries. It has spectacular fall color. This large, spreading shrub can be used as a specimen plant, for screens, or may be placed at the back of a shrub border. Children enjoy using the flower heads of the sterile form for spring time snowball fights! Phenology: Bloom time: May-July; Fruit ripens: September-October. Persisting through winter. Propagation: Seed propagation is difficult. Seed is best sown in a cold frame as soon as it is ripe; it may take more than 18 months to germinate. Stored seed requires 2 months warm and 3 months cold stratification and may still take 18 months or more to germinate. Cuttings root easily. Softwood cuttings may be taken in early summer; half-ripe wood in July or August; or mature wood in winter. Layering is also possible. Use by people: Kalnya (Viburnum opulus) is a national symbol of Ukraine. Ancient Slavs associated it with the birth of the universe. Its berries symbolize blood and family roots. Kalyna is often depicted in Ukrainian embroidery. The fruit of European varieties tends to be bitter and is not used for food. The berries of American Cranberry Bush can be used as a cranberry substitute for making jellies and preserves, but the fruit may cause mild stomach upset when eaten unripe, and large quantities may cause vomiting and diarrhea. Some natives mashed the berries and dried them into cakes for future use. The dried bark has been used in preparations to alleviate painful menstrual or stomach cramps, hence the common name “Cramp Bark.” A red dye or ink may be made from the fruit. Stems without pith were used to make popguns in the absence of elderberry. Use by Wildlife: Thrushes, robins, and Cedar Waxwings are considered the principal seed dispersers. The fruit is perhaps not a favorite of wildlife; it is not normally eaten by birds until after it has frozen and thawed several times. It is, however, known to be eaten by deer, moose, foxes, raccoons, chipmunks, squirrels, skunks, mice, rabbits, grouse, pheasants, and other songbirds. This large shrub provides cover and nesting sites for many small animals. It is a larval host for the Spring Azure Butterfly and sometimes attracts aphids. The flowers are pollinated by insects. This entry was posted in Deciduous Shrubs & Vines on June 5, 2017 by habitatdana. Names: The name Viburnum comes from the Latin word for Viburnum lantana, the Wayfaring Tree. 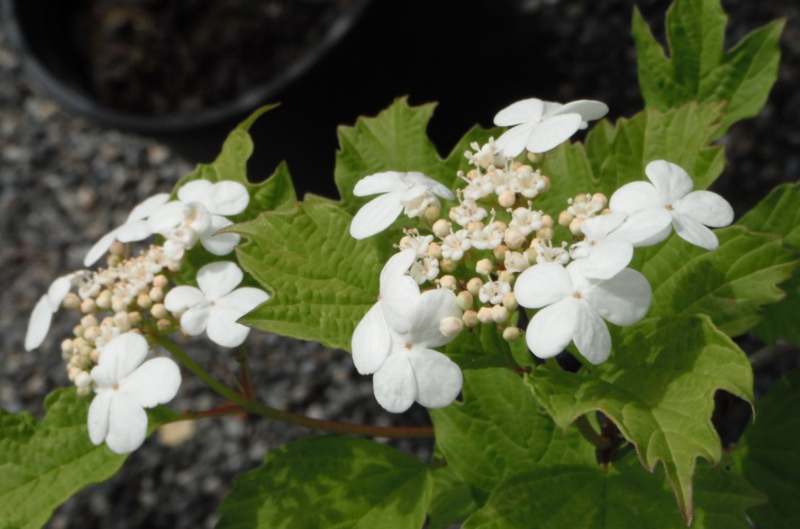 Highbush Cranberry is also known as Squashberry, Mooseberry, Moosewood Viburnum, Lowbush Cranberry, Few-flowered Highbush Cranberry, Pembina, Pimbina, or Moosomin ( in Cree Language). It has also been known as V. opulus var. edule and V. pauciflorum (meaning few-flowered). Edule means edible. Highbush Cranberries get their name from their cranberry-like red berries that grow on tall shrubs, in contrast to true cranberry plants, Vaccinium (Oxycoccus) sp. which are small creeping shrubs or vines. Distribution: High Bush Cranberry is found all across the northern United States and Canada; from Alaska to central Oregon in the west. It is listed as endangered in Wisconsin; threatened in Michigan, New York, and Vermont; and of ‘Special Concern’ in Maine. 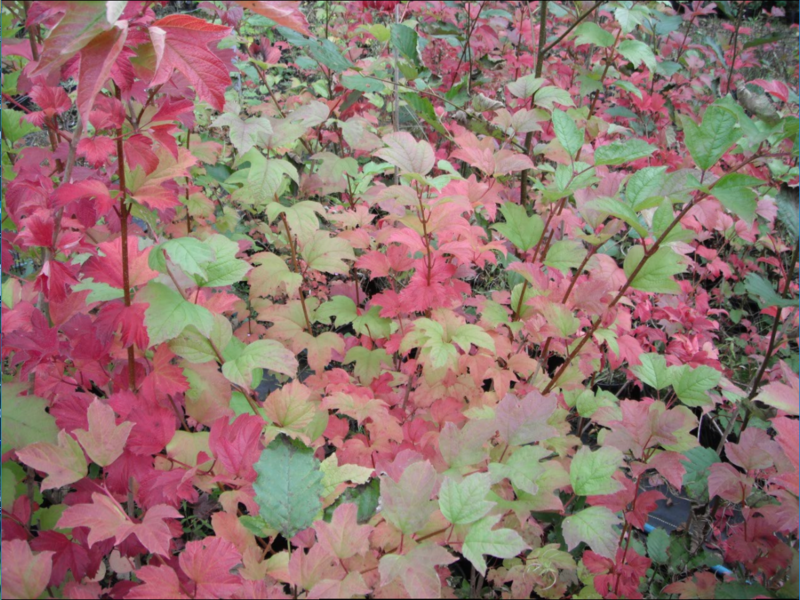 Growth: High Bush Cranberry grows 1.5-9 feet (.5-3 m) tall. Habitat: It is found in moist woods, forest edges, rocky slopes, along streams, and in swamps. Wetland designation: FACW, It usually occurs in wetlands, but is occasionally found in non-wetlands. Diagnostic Characters: Its leaves are opposite, usually shallowly palmately 3- lobed and sharply toothed; sometimes looking almost like a dinosaur footprint. The white flowers are all alike in small clusters, with no ring of sterile flowers. Fruits are red or orange berry-like drupes, each with a large flattened stone. Bark is smooth and reddish-gray. 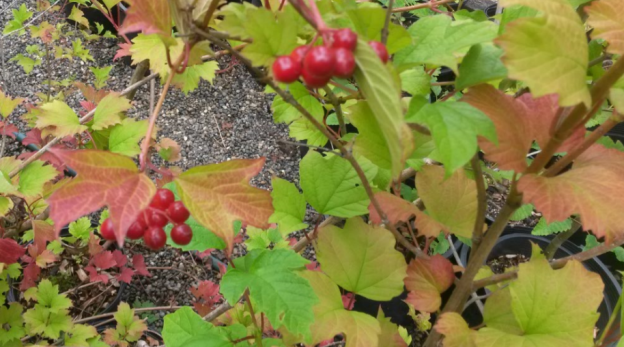 In the Landscape: Highbush Cranberry has attractive flowers and fruit, and brilliantly colored foliage in the fall. It is one of the most sought after shrubs for the wildlife gardener to attract birds to their garden. The tart berries may be enjoyed by both people and wildlife. Phenology: Bloom time: May-July; Fruit ripens: Late summer persisting through winter. Propagation: Seed is best sown in a cold frame as soon as it is ripe; it may take more than 18 months to germinate. Stored seed requires 2 months warm and 3 months cold stratification and may still take 18 months or more to germinate. Cuttings are easier. Softwood cuttings may be taken in early summer; half-ripe wood in July or August; or mature wood in winter. Layering is also possible. Use by People: The tart fruits were an important food to many tribes. They were harvested, sometimes while still greenish, or later after the first frost, and stored in boxes with water and oil; becoming softer and sweeter over time. They were sometimes dried. The fruits make excellent jams, jellies, juices, or sauces. Pojar & Mackinnon state: “When mixed half-and-half with commercial cranberries, they make an excellent Thanksgiving cranberry sauce.” Raw fruit can cause nausea in some people if it is eaten in large quantities. The bark was taken for coughs and digestive disorders; leaves and twigs were used to make a gargle for sore throats. The stems were used for birch bark basket rims. 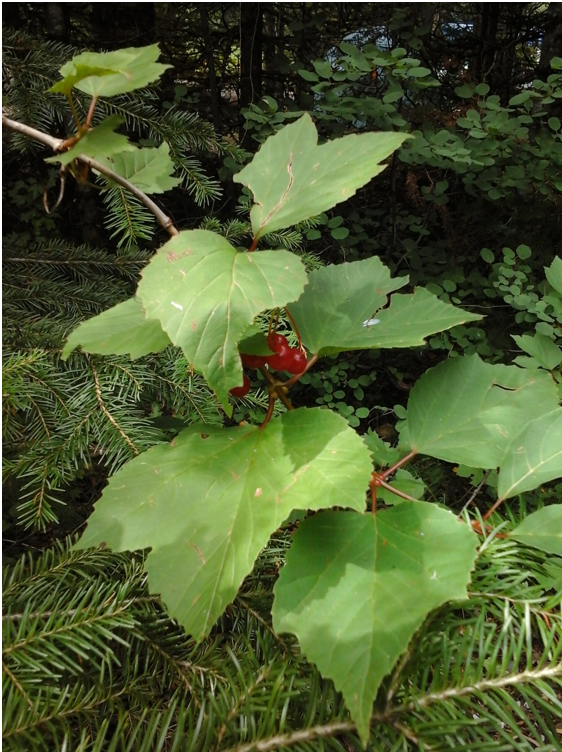 Use by Wildlife: Highbush Cranberries are eaten by bears and many small mammals and birds. Foliage is browsed by elk, Bighorn Sheep, deer, moose, caribou, beaver, rabbit, and snowshoe hare. The plant also provides cover for small mammals and birds. Butterflies visit the flowers. This entry was posted in Deciduous Shrubs & Vines on May 8, 2017 by habitatdana.